The theme of the upcoming 4th Asia Pacific Forum on Sustainable Development is “Eradicating Poverty and Promoting Prosperity in a Changing Asia Pacific.” The theme speaks of the need to successfully implement the Sustainable Development Goals (SDGs) in the region. Solving the development needs in Asia Pacific will have significant global impacts as the region is home to almost 60% of the world’s population. The region is also home to the 60% of world’s hungry, and almost half of the world’s poorest. Average income levels in the region in real terms are on a downward trend as inequality within and between Asia Pacific countries continue to rise. Implementing the SDGs in the region is a costly venture. 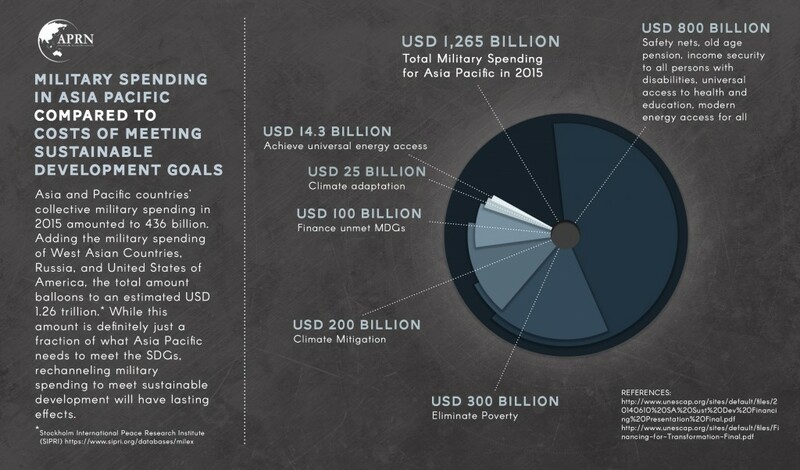 The Economic and Social Commission of Asia Pacific (ESCAP) in 2015 released the report titled “Financing for Transformation: From agenda to action on sustainable development in Asia and the Pacific.” The report identifies the region’s financing needs and potential sources of additional finances. According to the report, “it could cost the region from $2.1 trillion to $2.5 trillion per year to close the region’s infrastructure gaps, provide universal access to social protection, health and education, and implement climate change mitigation and adaptation measures.” Around USD 500-800 billion per year until 2030 is needed to close gaps on safety nets, old age pension, income security to all persons with disabilities, universal access to health and education and modern energy access for all. Elimination of poverty will require USD 300 billion while the unmet Millennium Development Goals (MDGs) will need USD 100 billion per year until 2030 in financing. In terms of infrastructure, recent Asian Development Bank (ADB) estimates 1.5 trillion per year to meet the region’s infrastructure needs. Adjusting this cost for climate mitigation would need USD 200 billion per year. The International Energy Agency (IEA) estimated that around USD 14.3 billion annually is requires to achieve universal energy access by 2030 for the Asia-Pacific region. According to World Bank (2010) estimates, the region will need costs for adaptation to climate change would amount to USD 25 billion annually. Governments and multilateral bodies are in consensus that while countries can mobilize domestic resources, additional finance will have to be mobilized through private sector investments through Public-Private Partnerships (PPPs), specially in infrastructure. Indeed, the private sector’s role in development is being promoted disproportionately against their accountability. Civil society and grassroots movements in the region are wary of this trend because of previous and current experiences related to private sector control of operations and ownership of infrastructure important to delivering services such as water, electricity, health, education, etc wherein these vital services have become inaccessible especially to the marginalized since they have been transformed into profit-making ventures instead of public service. Grassroots communities specially farmers, indigenous, and fisherfolk are specially worried about increased private sector investments in agriculture and extractives as these can lead to resource grabs. Aside from funding gaps, one of the systemic barriers in achieving the sustainable development, but least discussed, in the region is militarism. The ongoing conflict in West Asia, as well as territorial disputes in the South Asia and East and Southeast Asia has led Asia Pacific to become the most militarized region. While the Trump’s policy in Asia Pacific with respect to security remains yet to be seen, it is quite possible that there would be no significant changes from the Obama administration’s Pivot to Asia that aims to contain China’s growing influence through deployment of military personnel and infrastructure in the region. Militarization within countries is often used to suppress dissent and pave the way for resource grabs from communities. The continuing conflict and the development of new ones in the region is preventing the success of development efforts and violating human rights. Militarism also diverts huge amounts of resources away from sustainable development spending and is even more than three times bigger than the unambitious official development assistance (ODA) commitments of developed countries, which up until this day remain unfulfilled. Asia and Pacific countries’ collective military spending in 2015 amounted to 436 billion. Adding the military spending of West Asian Countries, Russia, and United States of America (USA), the total amount balloons to an estimated USD 1.26 trillion. While this amount is definitely just a fraction of what Asia Pacific needs to meet the SDGs, rechanneling military spending to meet sustainable development will have lasting effects. Below are a few examples of costs of meeting SDGs versus military spending. Arms imports are on the rise too. Data on arms imports of Asia Pacific countries suggest an upward trend on spending during the past decade. In 2016, total arms imports amount to USD 22.752 billion, signifying an increase of 48% since 2007. The cost of damage to property, agricultural lands, the displacement of entire communities, and millions of lives lost due to extensive military operations and wars are not yet included in the current calculations on the cost of rising militarism in the region. Moreover, the damage done by warfare in the development process even reverses whatever development gains have been achieved at the country-level. Clearly, military spending can be looked upon as a source of finance that should be diverted to spending on development. Thus, the reduction and rechanneling of military spending to finance development goals can serve as an effective indicator towards achieving the SDGs. If militarism continues to be ignored as one of the systemic barriers in the achievement of sustainable development, the Agenda 2030 is bound to fail the development needs of the billions of populations affected by militarism living in Asia Pacific.